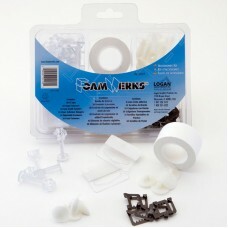 Join, fasten and hang foamboard projects with this handy kit. Over 100 pieces include tape, snap fasteners, adjustable fasteners, push fasteners, plus saw-tooth and clear adhesive hangers. Includes clear reusable storage case.